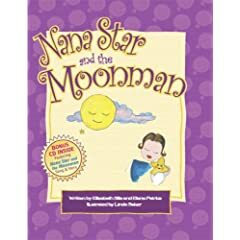 Nana Star and the Moonman (2008) is the second book in the Nana Star Series. In this book, Nana Star continues her journey to return the little star back into the heavens. Scared when night comes and the world has gone to bed without her, Nana Star meets the Moonman,who promises to watch over her whether it is day or night! Comforted by the fact she has a friend looking out for her, she continues on her journey with Moonman pointing her toward a sailboat that’ll help her bring the baby star home. Book comes with a 2-track CD: the story being read and a song. The book brings many positives to nighttime, including the message that your little one is being watched over by the Moonman, even if they cannot see him. The adorable song on the CD will leave children drifting off to sleep into a warm, safe world. Nana Star and the Moonman is a good addition to any children’s bookshelf.